Back in 2006, Apple ran the first of many different variations of “friendly warfare” commercials, which pretty much portrayed the competition (Microsoft) as a nerdy, uncool, unorganized human (played by John Hodgman), while the “Mac” was a cool, casual, suave human (played by Justin Long). 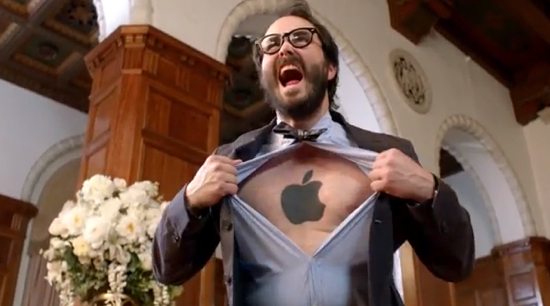 After four years the aptly titled “Get a Mac” ad campaign is coming to an end. Apple’s site has changed over to the “Why You’ll Love a Mac” page, and Justin Long even suggested a few months back that the ads were starting to dry up and he didn’t see them continuing much longer. Losing their edge or not, it was always a treat for Apple fans to get these ads sandwiched into spot breaks between our favorite shows. Hodgman, who was also a regular contributor to The Daily Show, garnered certain fame from the campaign and has even been invited to give commencement speeches at several universities. We’ll always remember the epic promotional campaign, and some of our favorites as well. After the jump, check out one of those personal favorites, guest starring the amazing Rowan Atkinson as Mr. Bean. R.I.P. “Get a Mac” Ads. As you probably know, especially if you’re a regular reader of this site, Apple recently released a tablet computer called the iPad. The device, a touch screen wonder that’s sold over a million units since its introduction, is an amazing piece of technology. But given that, what is it exactly? Well, if you’re someone who’s asked that question, Apple’s now got you covered with a new commercial. The “What is iPad” spot debuted today and tries to answer that question by emphasizing the iPad’s usability, huge and diverse selection of applications, multimedia capabilities, web-related features and what Apple really does best, the iPad’s intuitive user interface. Of course, the commercial also shows the iPad being put through its paces by a number of cool people, which only serves to make the device look even sexier and more “magical.” Oddly, even with all those people using the iPad, nary a fingerprint can be seen on its glossy screen. Maybe Apple should share the “magic” of that little iPad secret with the rest of us? Check out the new commercial after the jump. The iPad is available now. Tagged: Advertising, Apple, Commercials, Gadgets, Gear, iPad, Tech, Video, What is iPad?